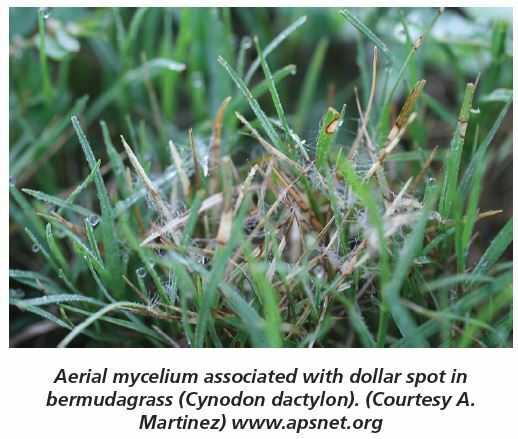 Dollar spot on turfgrass is a foliage disease caused by the fungus Sclerotinia homoeocarpa. Symptoms appear on individual leaves as light-tan-colored lesions on the tips or laterally across the middle of the blade. Lesions are surrounded by dark-brown borders. Multiple infected leaves merge together to form a circular, straw-colored, silver dollar-sized patch in the turfgrass. The patch may exhibit white, cottony fungal mycelium in the morning when dew is present. 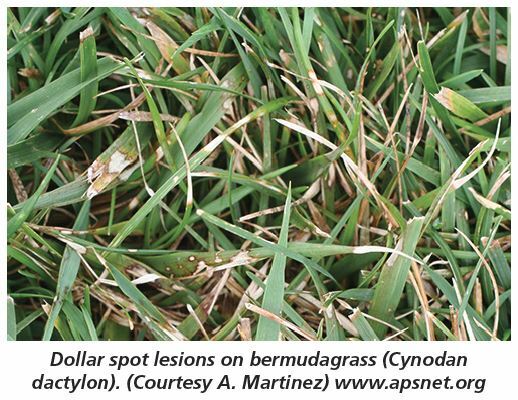 Dollar spot is typically observed in the spring and fall and commonly affects bermudagrass and seashore paspalum. Optimal temperature range is 60 to 90 degrees Fahrenheit. Lawns deficient in nitrogen are more prone to dollar spot. Other abiotic stresses, including drought stress, excessive irrigation, improper mowing height and excessive thatch buildup favor dollar spot development. Disease develops rapidly during extended periods of leaf wetness from rainfall, irrigation or morning dew. Disease spreads from affected lawns via infected grass clippings moved by equipment or blown by wind. The pathogen survives in the thatch layer. Symptoms are typically observed in the spring and fall. Light-tan-colored lesions on the tips of individual leaves or laterally across the middle of the blade. Circular, straw-colored, silver dollar-sized patch in the turfgrass. Presence of a white, cottony, fungal mycelium in the morning dew. White, cottony mycelium on leaf blades may resemble fungal mycelium produced by Pythium blight and large patch diseases. Maintain adequate soil fertility. Nitrogen-deficient turfgrass is more prone to S. homoeocarpa infection. Homeowners should have their soil tested routinely and specifically before establishing a new lawn. Irrigate lawns as early as possible in the morning while taking rainfall into account. Water deeply but as infrequently as possible without causing drought stress. Drought-stressed turfgrass is especially susceptible to S. homoeocarpa infection. Improve internal soil drainage and reduce compaction by aerating the lawn regularly. Minimize shade and improve air circulation over the lawn to reduce the period of leaf wetness. Raising the mower height can help the turfgrass recovery. Do not mow lawns when grass is wet. Mow diseased areas last because some fungal pathogens spread to healthy areas through infected grass clippings. Washing lawn mowers to remove grass clippings may help reduce the spread of disease. Excessive thatch can negatively affect turfgrass growth and provide a suitable environment for S. homoeocarpa survival. Dethatching may be necessary to improve turfgrass growth. In addition to cultural practices, fungicide applications may be required to achieve effective disease control. Always check fungicides labels for site application restrictions. When selecting products, homeowners must purchase fungicides that are labelled and recommended for residential lawns. When using fungicides, always remember to follow the label rates and frequency of application. 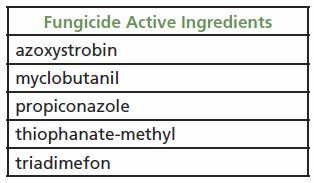 Fungicides used to manage dollar spot are sold under various trade names. They contain these active ingredients. Need more information? Visit www.lsuagcenter.com to contact your local LSU AgCenter parish office. To submit turfgrass samples for disease identification, send them to the Plant Diagnostic Center. For information on sample collection and submission guidelines, visit: www.lsuagcenter.com/PlantDiagnostics.